Briksha, born in small village of Himalaya, is a yogi, a certified rebirthing breathwork practitioner, Integral coach and raw vegan chef. several long silent retreats up to 30 days. In his Journey with the breath, Briksha draws from a variety of yogic breathing modalities, including Holotropic Breathwork, Clarity Breathwork and Anapanasati. He has been teaching and leading breathing sessions and meditation classes for over 10 years. He worked as a head raw vegan chef in Tree of life for a year and at Cafe Gratitude for 4 years. 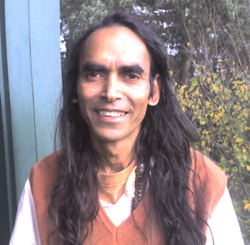 Briksha`s main mission to share his knowledge and experience is to help people awaken in their body, breath and mind and learn a peaceful life in the midst of busy world. has over 200 hrs Yoga Teacher training from Urban Flow Yoga Studio.